Christina thinks the dodgy guys who are after her are outside the door. She phones Caroline in a panic. Joe and Todd are gardening. Christina calls the witness protection policemen who arrest Joe! Caroline has arrived home and Christina tells them that the police have taken Joe away. She's very freaked out and hopes Joe doesn't have an accomplice. CAROLINE: Don't worry, it'll soon be all over. CHRISTINA: Well, I hope so, because I can't stand being locked up all the time! Caroline says they can arrange something so Christina can get out more. 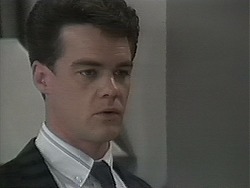 Bronwyn pops round to see Kerry and tells him that two blokes have taken Joe off in a car. Kerry wonders if they could have been plain-clothed policemen. She wonders if it could have anything to do with the answering machines that Joe picked up in the pub. She goes off to ring the police to find out where Joe is. Beverly is off to the hospital. Madge is flying out tonight. Helen thinks that Beverly is working herself into the ground to avoid grieving about Rhys's departure. Harold dashes in and tells them that Joe has been arrested. Caroline ("Linda") arrives to meet Melanie to go and see a movie. Melanie is elegantly dressed in a long black strapless dress. CAROLINE: We are going to a movie, aren't we? MELANIE: Oh, yes, I always like to get dressed up for Mel Gibson! She suggests going out to a Mexican restaurant but Caroline has got things to do at home later. Melanie is suspicious that Caroline spend so much time at home and seems to have a lot of people dropping by. Caroline is evasive. CAROLINE: It's pretty obvious you're curious. 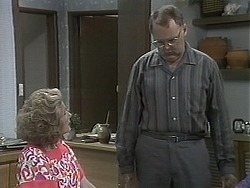 MELANIE: And it's pretty obvious you're secretive! CAROLINE: I'm just the type of person who doesn't like her friends spying on her. They leave for the movie. Christina is vacuuming when the phone rings. 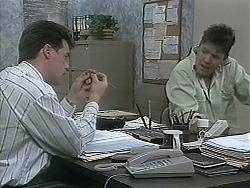 Paul rings for "LInda" and tells her that she has to come back to the office straight away. Christina tries to say that she's too busy, but Paul says it's an emergency. He tells her to hurry. CHRISTINA:(putting the phone down) Great! She picks up Caroline's clothes and goes off to change. 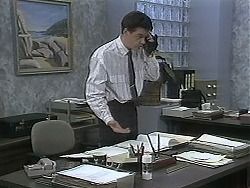 DETECTIVE: Tell me, Mr Mangel. Do you make a habit of hanging around single women's houses? JOE: I wasn't hanging around. Joe insists he wasn't prowling - he was only looking in the window to see if anyone was home. He's a gardener and the shovel was for his work. He tells them to call Paul and get him to vouch for him. The police get interested in Joe's livelihood and seem to imply that he's "got in with the wrong crowd". They think he's been paid to keep tabs on the neighbours. He is very confused and doesn't know what's going on. The police say he might be behind bars for the rest of his life! Paul is giving Christina the final details for the report she's writing for the client. She's understandably confused but trying to cover. Paul is a bit irritated by her failure to find the files. Paul sends Christina off to meet the client and tells her to take his car. Joe has finally made it home. He has no idea what's happened - there was no charge pressed against him. He says the only thing he did was to look in Paul's window because of all the rumours and that. Bronwyn explains about Hilary's theory that Caroline is running a house of ill-repute. KERRY:(laughing) Oh, that's ridiculous. Joe, you dirty old man. JOE: Oh, look, I can't help it if I've got an enquiring mind! KERRY: Is that what they call it these days? JOE: I didn't see anything! He assures Harold that he's not in trouble with the police. Joe still thinks that there's something odd going on in that house because the police asked him some weird questions. JOE: They asked me if I was paid to spy on her - like there was some kind of conspiracy going on! He resolves to talk to Paul about it. Beverly sees a woman with a baby and smiles at her. She comments on how beautiful the baby is and tells the lady that she has a baby too - called Rhys. Then she walks away. Joe is telling Paul about the business at the police station. He's surprised that "Linda" didn't mention it when she came into the office earlier. PAUL: Maybe this explains those odd mood swings she has. The phone rings and it's "Linda" (Christina). She's in a phone box and tells him that there's been an accident - she's crashed his car. Paul isn't pleased. Melanie and Caroline are coming out of the movie. Caroline ducks into a phonebox to call Christina. There's no answer in the house and Caroline is very worried. She dashes off home, telling Melanie that she doesn't have time to stop for coffee. Beverly has come home early. Helen sees that she's upset and offers her a cup of tea and a piece of cake. Beverly refuses to talk about anything though. Joe is telling Kerry and Bronwyn that he thinks Paul will probably fire Linda for crashing his car. 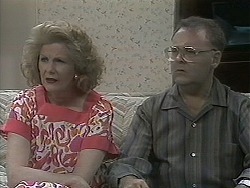 They discuss Linda's odd behaviour and wonders what Paul will say to her. Paul has come round to talk to "Linda". He's ranting about his car and then tells Linda that she's very erratic - half the time she's great and the other half she's just weird. He wants to know what's going with the police and says that if she doesn't explain what's going on, she's fired. PAUL: No Linda, I don't. Now, goodbye. Just then Caroline comes in. Paul does a double-take.